Last week I went to Virginia for a blogging event with Sabra. We toured chickpea fields, took a tour of the hummus factory, and tasted lots and lots of hummus. I was on a hummus high:) When I got home I was going through hummus withdrawals so I made a Roasted Red Pepper Hummus, Avocado, and Feta Sandwich. This quick and easy sandwich is a new favorite. It has all of my favorite flavors in one sandwich! It’s been in the 100’s in Utah so I haven’t been cooking a ton, plus I have been traveling a lot. So simple meals have been my best friend. 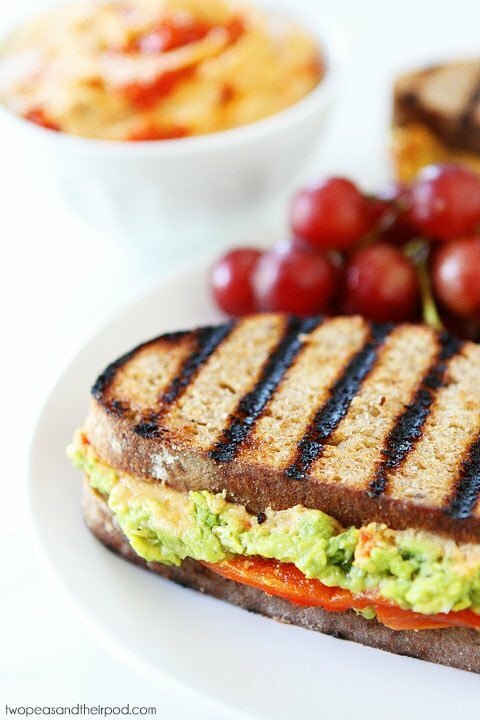 This Roasted Red Pepper Hummus, Avocado, and Feta Sandwich only took minutes to make and really hit the spot. Sandwiches are great for lunch, dinner, and I can even see myself eating this tasty sandwich for breakfast. I used Sabra’s Roasted Red Pepper Hummus. It is one of my all-time favorite hummus flavors and is amazing on this sandwich. I also mixed together smashed avocado, feta cheese, basil, and a little splash of fresh lemon juice. I spread the hummus and avocado feta mixture on whole wheat bread and added roasted red peppers. Josh had the grill on-he was grilling sweet corn, so I had him grill the sandwiches. Best decision ever! 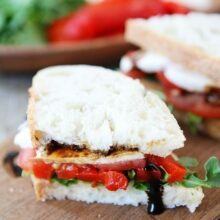 I loved the warm toasted bread with the creamy sandwich fillings! We enjoyed these sandwiches for dinner with fruit, sweet corn, and pita chips. It was the perfect summer meal. And our little pea devoured his sandwich. He had hummus, avocado, and a big smile on his face. He approved! This simple Roasted Red Pepper, Avocado, and Feta Sandwich is great for a quick meal. It only takes minutes to make, but will leave you satisfied! I know we will be making this sandwich again and again! 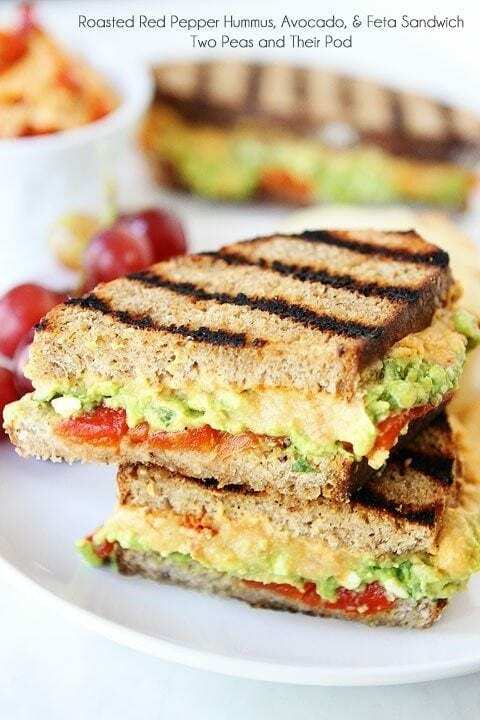 This vegetarian sandwich has all of my favorite flavors-roasted red peppers, hummus, avocado, and feta cheese! 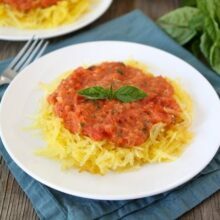 It's easy to make and great for a quick lunch or dinner! 1. 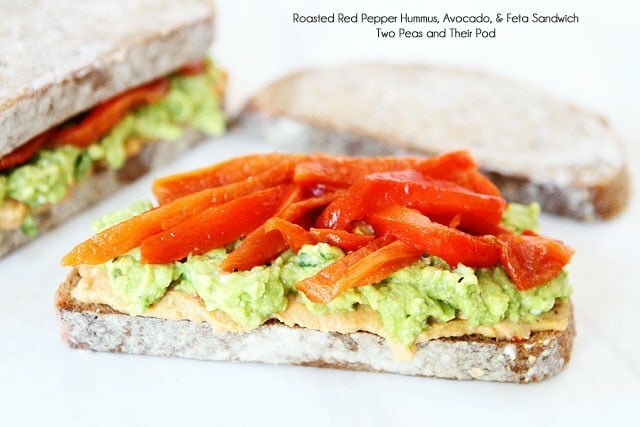 Spread the bread slices evenly with roasted red pepper hummus. Set aside. 2. 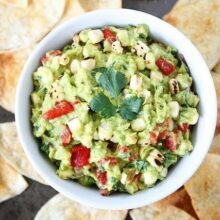 In a small bowl, combine avocado and feta cheese. Mash with a fork. Add the lemon juice, basil, salt, and pepper. 3. Spread the avocado feta mixture over the red pepper hummus. Top with roasted red peppers, on two slices of the bread. Place other pieces of bread on top to form a sandwich. 4. Brush the outside pieces of bread with olive oil or butter and place on a hot grill or hot pan. Grill each side until toasted, about 2-3 minutes. Serve immediately. Note-you can serve the sandwich cold, without grilling it. It is just as tasty! For gluten-free, use gluten-free bread. Disclosure-this post is in partnership with Sabra, but of course our opinions are our own! This sandwich looks incredible! Yum!! Yum! This sandwich looks out of this world! Would love this for lunch!!! Wow. That looks so simple and perfect. Love the pictures! This sandwich is definitely screaming to me! Love it! So simple but I never would have thought to make a sandwich like that. Thanks! I made a huge batch of roasted red peppers this weekend… and have been looking for ways to use them. Cha-Ching! Looks super delis! You said it – all my favorite things in one sandwich! Would make a perfect lunch! 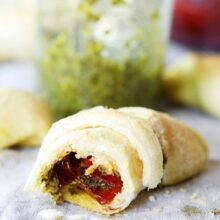 I love this for lunch, especially with the roasted red pepper – mmmm! Yes, please!! This is my kind of sandwich! Love all that avocado! looks amazing, love those grill marks! Perfect little sandwich. Healthy and yummo. Oh, this is getting made. You can put money on it. I figured you would have made your own hummus! We love making our own hummus, but in a pinch we use Sabra’s hummus! It is good stuff and great for when we don’t have time to make our own. I am obsessed with this sandwich! So many layers of deliciousness. And red pepper humus is my fav, too! Love this combo. A must try! Looks great! This reminds me that I don’t use my panini press nearly as much as I should. I love everything about this sandwich! Light and flavorful! I’m having some girlfriends over for lunch next week and I think they’d be so impressed if I grilled these for them! I am so so so in love with this sandwich! My goodness. All of my favorite ingredients stuffed into one amazing sandwich! Great recipe!! 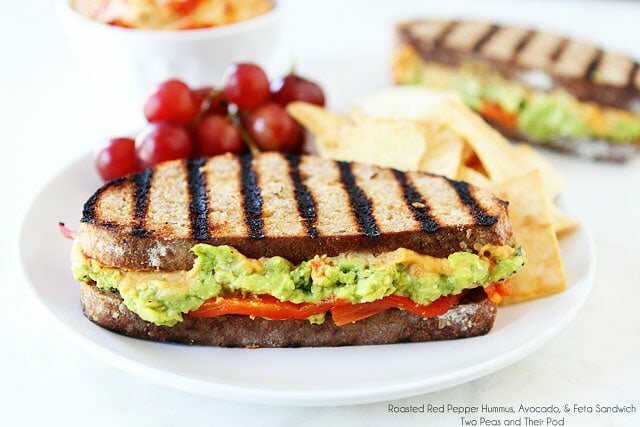 I love red pepper hummus, this is my kind of sandwich! You’re speaking my meat-hating pregnant language!!!! LOVE !! 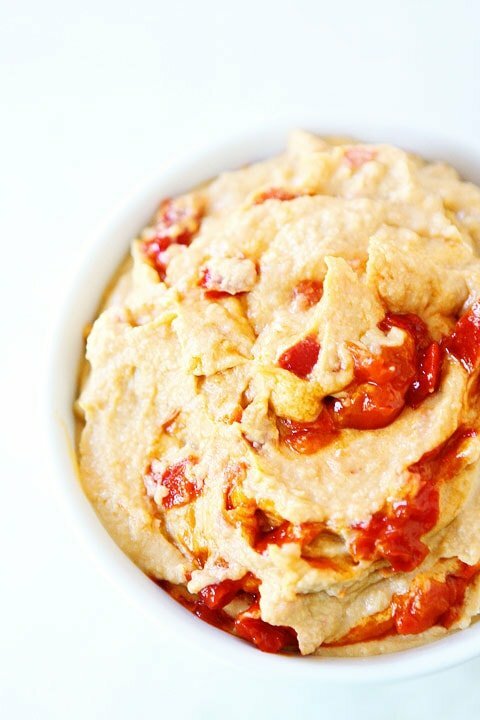 The sweet caramelized flavor of roasted red peppers is so great in hummus! I love this sandwich…so many fun flavors in every bite. This is a sandwich I could happily eat everyday. Great flavors, Maria! Not sure I could get the humans past the guys but the rest of it sounds like a definite doable combo for my house. I understand we had that heat last week and the ac working overtime so the thought of cooking in that heat is just about as high on my list as a root cannel. I will try this one soon, well when the heat comes back it has dropped to a very pleasant 70 so cooking seems ok. This recipe looks great. Just got a new sandwich prep table (True TSSU-48-12) and am in the mood to make tons of sandwiches over the next few weeks. Going to attempt to make this one, hopefully the kids like it! I love everything about this sandwich! Youre making me want to go make it immediately!! Chickpea fields?! Are a thing?! In Virginia! You just blew my mind. 🙂 I love hummus on a sandwich–this looks delicious! Made these last week and they were AMAZING! So good that I’m back here tonight getting the recipe again to make them for us for dinner today. My rather large husband finds these as filling and satisfying as any other meal I make. He said it reminded him of our trip to Italy eight years ago when we dined on great paninis sitting out on cobblestone patios and squares. I can’t say enough good things about these. I have actually been craving these since I made them the first time and am so excited tonight is the night! This is so one of the best sandwiches I have ever had! I made it for my lunch today at work so I was unable to grill the bread. Now I want to go home and have it for dinner because I can only imagine how much better it will be after grilling! Delicious! I added some bacon and grilled chicken to appease my meatatarian fiance. The crunch of bacon took the sandwich to another level. Drain a can of chickpeas and put them in a food processor with juice of one lemon and two or three cloves of garlic. Process while drizzling in some olive oil until you like the consistency. Use this homemade hummus on your sammie along with roasted peppers and avocado slices. Other veggies work well too. Tomato slices, cukes, grilled portobellos, sweet onion slices, experiment and make something different each time. Yummy! Try this with goat cheese instead of feta…it’s nice and creamy! Do you have nutritional break down for your recipes? Made this today! Didn’t have feta, but the sandwich was still extremely delicious! It’s so tasty when it’s grilled/ heated up. Thanks for the great recipe! Pingback: 25 Different Ways to Eat Hummus. #5 Is Absolutley Authentic! These are great, though I didn’t make them exactly to recipe. Made them open face on one slice of bread (Wholesome Harvest 9 Grain & Seed bread) toasted in a toaster with no additional oil or butter. Used regular hummus instead of Red pepper and did not use jarred rosted red peppers, instead peeled and sliced up a raw red pepper for crunch. And I didn’t use the basil. I hate cilantro, but did think cilantro lovers could replace the basil with cilantro. Did anyone make this sandwich the night before for lunch the next day? Just wondering if it got soggy? Or if you have any tips from preventing it from getting soggy. Since its layered with hummus and avo smash I assume the bread would soak it up overnight? THANK YOU THANK YOU THANK YOU! This sandwich was OUT OF THIS WORLD! My boyfriend LOVES this sandwich – he almost ate mine hehe He’s very picky, so I’m glad you posted this! Pingback: Wellness Wednesday 7/15 | The Evolution! Opps! I bought goat cheese crumbles at the store instead of feta! Still is yummy! Yummy Mistake! But I still wonder what the feta one tastes like!!! Pingback: 7 portable meals to spice up your lunchtime routine | Noom Inc. The sandwich would be a little bit better with some sliced sirloin, medium rare. Oh my gosh. This literally looks like heaven…. This is the best sandwich I have ever had! Wow! 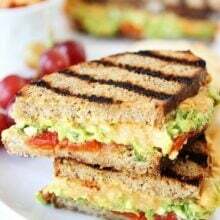 I rarely leave reviews but this sandwich is so easy, nutritious and flavorful that I have to! This is on regular rotation in our house and it’s so satisfying. It also makes great leftovers so I build my sandwich and put it in the fridge for the next day! My meat-loving husband loves it too because it’s super filling!